Ming knows you like it simple and efficient in the kitchen. A place for everything and everything in its place. You do your prep work and like to have everything at the ready while you cook. And when you cook, you like fast results. 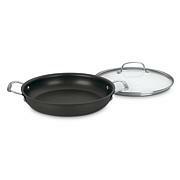 That's what makes the Mingtsai 12" open fry pan a perfect fit. Technolon+ ceramic nonstick interior coating provide even cooking and fast results when the family has on their dinner game face. Another simple, convenient kitchen solution from Ming! 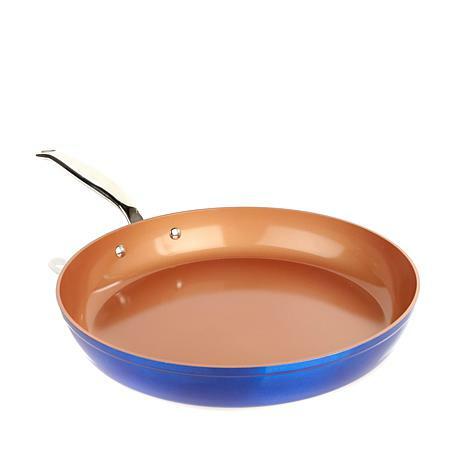 Ceramic non-stick coating is metal utensil safe with gentle use. 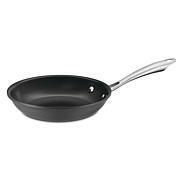 Plastic, rubber or wooden utensils are recommended to prolong the life of the pan. 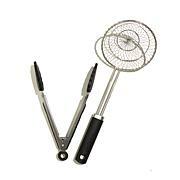 Cooks evenly and cleans up in a snap! I have purchased two of these and have had the first one for over 6 months. The original looks as if it came out of the box, still. I have nothing negative to say about these pans. They function wonderfully and expect to use them for many years to come. Best cook ware ever. Truly nonstick. Have a lot of Ming's products all perform great and the colors are more vibrant than you can imagine. 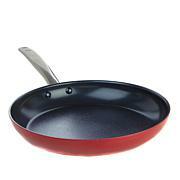 Bought three of these Ming Ceramic pans in different sizes, all in the beautiful, vibrant red. I do have to spray oil to prevent food from sticking, but they do not show any scratches or any type of damage from use, so far. They look exactly they way they did when I received them and we cook every single day, so they get plenty of use. Very happy with this purchase.